We attended a small family gathering last night. One of my hubby’s nephews has a new watch and I told him it looks good on him. He told me it was an Apple watch and I couldn’t believe it. 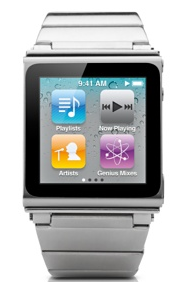 I didn’t know that Apple has a watch and it’s really cool because it’s a touch screen. For me it looks like a nano minus the strap and he told me it is a nano watch. Well, his nephew is really into Apple and most of his electronic stuff is all apple products. Sometimes I’m so behind with this high tech stuff and the only time I know there’s new electronic stuff is because my hubby tells me.